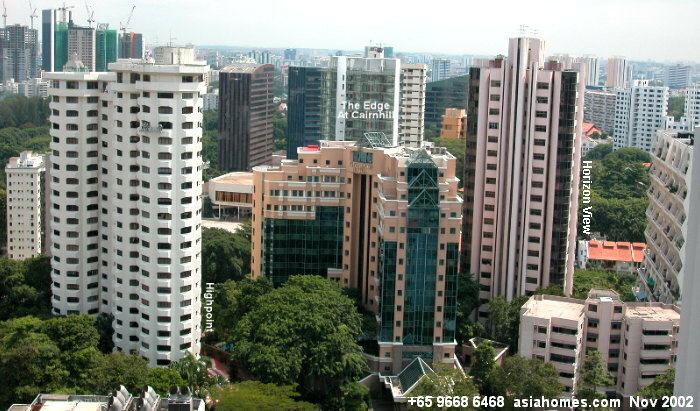 81 Cairnhill Road, Singapore 229683. 900 sq. ft to 1,510 sq. ft.
2-minute walk to Newton subway. This is the selling point. Security. Swimming pool, sauna, gym. 5-minute walk to the American Club. 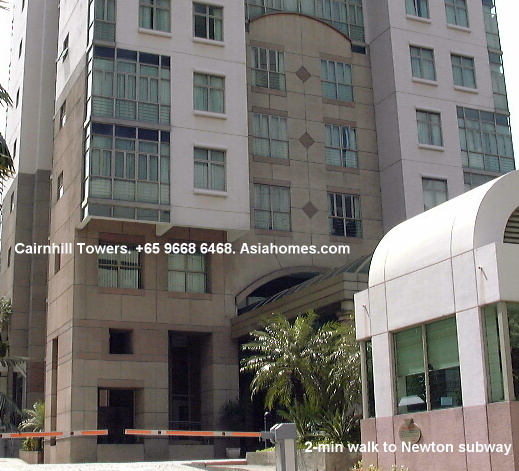 8-minute walk to Orchard Road, Scotts Road, Orchard subway. Pool Yes. Big swimming pool. Washing machine & dryer inside unit No. Laundry and drycleaning services available. The biggest unit at Cairnhill Towers is a 3 bedroom with a study room. It is a 2 storey penthouse with 3 bedroom on 1 level, living, dining and study on the 2nd level. There are 2 double and 2 single beds. The monthly rate is S$9,000 and subject to GST. This rate will includes 3 times a week housekeeping service except Sundays and public holidays, utility, local calls, basic tier cable tv and internet access. Please kindly advise how many of you will be staying in the unit. With the beds now, it will be good for 6 persons. Should there are 7 of you, I will have to check it may be possible to put a single bed in the study which is next to the living area. There is only a sliding door for the study. For a proper 4-bedroom unit at Far East Plaza, it will be monthly rate of S$13,000 and subject to GST. 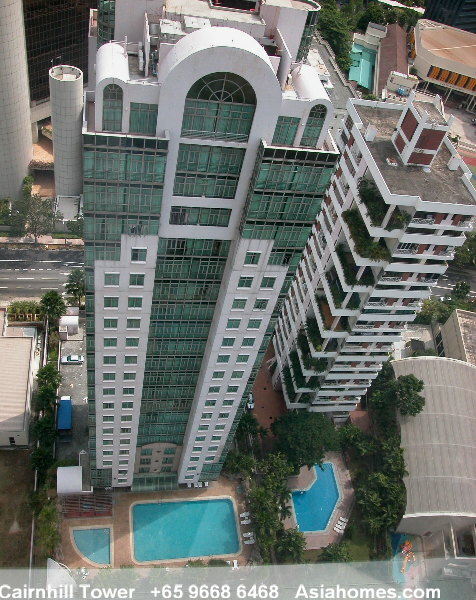 THE EDGE AT CAIRNHILL Condominiums are 3 towers each of 20-storey condo, totaling 46-unit luxury high-rise complex in the Newton Circle section of Singapore. There are three semi-circular towers (middle of picture on right). Each tower consists of a solid masonry curved wall on its inward side and a totally glazed, sun-shaded wall on its outward side, with a circular glazed room protruding out of the outward surfaces. Two of the towers accommodate one apartment per floor, while the third, with a slightly smaller footprint, accommodates stacked duplexes. and accommodation of Singapore's tropical climate, exterior sunshades cantilever out from all glass surfaces. 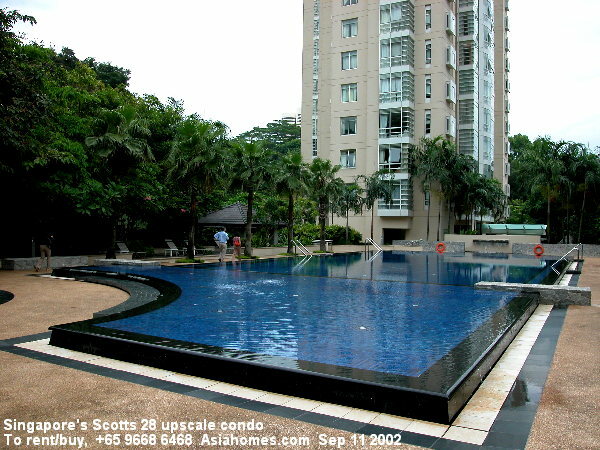 Foreign Investors interested in this property, email judy@asiahomes.com or tel:+65 9668 6468.